Small Dogs that Dont Shed are the BEST! Small dogs that dont shed is all about our fearless companions. Dogs that don't shed allow people with allergies to enjoy life with a dog and let's face it ... allergies or not ... no shed dogs are a wonderful thing! The Cockapoo is a cross between a cocker spaniel and a miniature poodle. 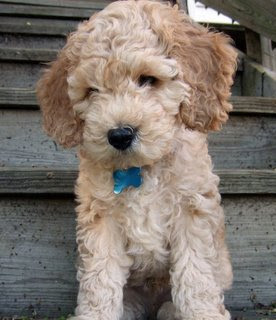 It is a hybrid dog that is sometimes referred to as a “spoodle” or “cockerpoo” and is one of the small dogs that don’t shed. The US began breeding them in the 1960’s they can range in size from 6 pounds to about 20 pounds and come in all sorts of color variations. In general, the Cockapoo is quite sweet natured and affectionate. An alert sociable dog, the Cockapoo strives to please its owner and gets along well with children when under supervision. Training should begin young and there are times when jealousy rears its head if their owners pay too much attention to other animals. These little guys are quite intelligent and are the perfect small pet dog for companionship. These dogs are ideal for someone that suffers with allergies as they are one of the no shed dog breeds. The coat of the Cockapoo will vary from dog to dog. Some will have the sleeker coat of the spaniel, while others may have curlier, coarser fur like a Poodle. For many Cockapoo's, their hair will be a mixture somewhere between the two. This means that daily brushing will be required in order to keep the hair healthy and mat free and clipped at least once a year to maintain their coat. As with a lot of smaller dogs they tend to be quite long-lived, and it's not unusual for Cockapoos to live to 15 years or more. When you are looking for small dogs that don’t shed, be sure to put the Cockapoo high on your list!